Can Fish Oil Supplements Cause Joint Pain? Joint pain occurs for many reasons and is a common musculoskeletal issue many Americans suffer from. When joints become inflamed, you can experience pain, stiffness and reduced mobility. Fish oil is commonly marketed for joint health, among other things. Currently, there is no evidence that fish oil supplements cause joint pain. In fact, the type of fat in fish oil may reduce inflammation, potentially combating joint pain. Fish oil contains essential omega-3 fatty acids your body needs but is unable to produce on its own. This means you have to get them through your diet. There is no evidence to suggest that fish oil, whether from food or supplements, causes joint pain. In fact, the omega-3 fats found in fish oil appear to reduce inflammation and may lower the risk for arthritis -- a condition characterized by painful joints -- according to the University of Maryland Medical Center. 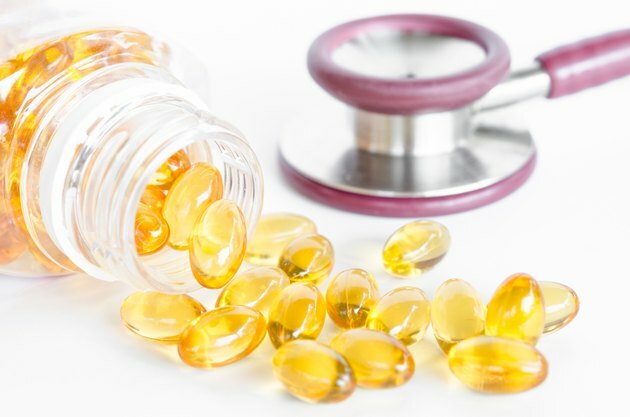 Fish oil supplements may offer benefits if you have joint pain, according to a study published in the April 2006 issue of the journal "Surgical Neurology." In the trial, participants took fish oil daily for about 2 1/2 months. About 60 percent of them discontinued taking nonsteroidal anti-inflammatory medicine for pain. At the end of the trial, 60 percent of participants reported an improvement in joint pain, and close to 90 percent said they would continue taking fish oil. Fish oil supplements are prone to going rancid and spoiling. This could render them ineffective, or even harmful, according to a April 2013 review published in the journal "BioMed Research International." Follow the manufacturer's instructions for proper storage to prevent spoilage. You typically need to store fish oil supplements in a cool, dry place away from heat and light. Fish oil supplements typically expire 90 days after you first open the bottle. Perform a smell test and throw them away if they have spoiled or have an excessively strong odor. Only take fish oil supplements for joint pain under the guidance of your physician and never discontinue your pain medication without permission. Work with your physician to determine how much fish oil to take. Fish oil supplements may cause side effects such as burping, heartburn and nausea and may leave a fishy aftertaste. Even though there are no reports of fish oil causing joint pain, discontinue use and contact your doctor if you experience joint pain you suspect is related to taking fish oil.